This Gist contains simple instructions on how to install, update, and uninstall BetterDiscord on Linux. For more thorough documentation, take a look at betterdiscordctl's README. Do NOT submit issues here as I don't check the comments. You should submit them here instead. Replace [COMMAND] with install to install BD for the first time, update to update BD to the latest version, reinstall to reinstall BD after a Discord update, or uninstall to uninstall an existing installation. Note: on Ubuntu/Mint and other Debian-based distros you have to add -s /usr/share to the commands to point BDCTL to the right path. Point betterdiscordctl to the correct path with the --scan flag. Discord has to be started at least once to create the necessary directories before using betterdiscordctl. You don't have git or npm installed. Install them. Install asar globally with sudo npm install -g asar and then use betterdiscordctl's --global-asar option. Does this work with the Snap version of Discord? Edit: any plans on making this work with Snap version of Discord? Updated to work with the Snap version of Discord. I'm getting the same problem when installing into both Discord Canary and Discord. (Ubuntu MATE) That said, I don't know to reverse this either, so I've been using the snap version of Discord without trying to install BetterDiscord. 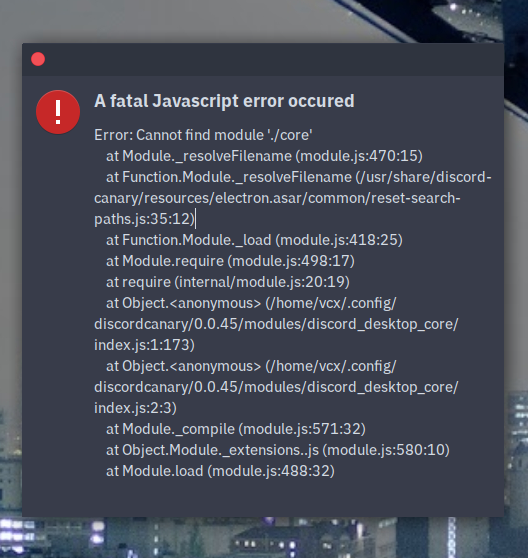 You can fix this error by deleting the discordcanary folder in /.config/ and discord-canary in /usr/share, then reinstalling it. I'd imagine you can do the same with the Discord stable as well. Have not been able to get BetterDiscord working though. Got it to work, but I merely just followed the instructions here again. If all else fails I suggest going to the BetterDiscord2 server and searching "linux in:faq" for answers rather than asking. @RemixSlay Don't install with sudo. ERROR: Discord installation not found. 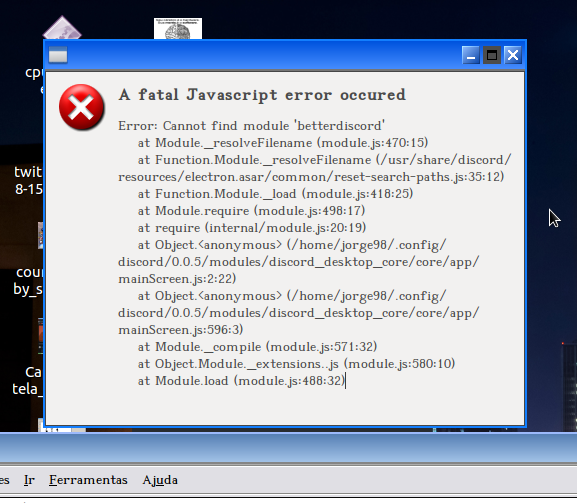 I got the same error as Trihash, even on Stable or Snap, the config directory isn't found (though it not exists). @Trihash You will need to elaborate more on the issue you have sumbitted. @miakx Please check the same issue and comment there if it remains unsolved for you. As it turns out, /opt worked for me. I didn't get any errors, It seems to have installed fine, but, the status says the app is not patched and it doesn't appear to have changed the discord app at all. WARN: Config directory not found for (/usr/share/discord, /home/spencer/.config/discord). Then you are trying to install betterdiscord into the wrong directory. RTFM. This happens here, what i should do? Solved this by using parent of binary root folder as path. With Discord binary @ /usr/bin/discord using betterdiscordctl install -s /usr worked [even though docs say to use path to binary root folder /usr/bin]. On Lubuntu 18.04, fresh discord install which discord returns /usr/bin/discord. I was getting the error ERROR: Discord installation not found when running betterdiscordctl install -s /usr/bin/. Using /usr as the [PATH] instead of the suggested path was successful. big thanks! works with 0.0.8 in debian stretch (backport: nodejs 8.11.1~dfsg-2~bpo9+ and npm 5.8.0+ds6-2~bpo9+1). tried using stable instead of snap or flatpak, and i used -s /usr/share to find the installation, which it detected, but if i ran the install command it still says no discord installation found. i'm on Pop OS 18.10.